Chorus CEO, Dan (back centre in white helmet), and his team are participating in this year’s Hawaiian Ride for Youth fundraising event, which takes off from Albany and Geraldton tomorrow! 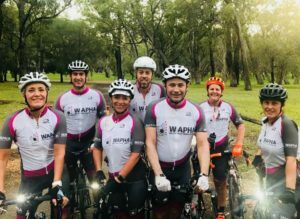 Dan and his team are riding for an amazing cause, raising money and awareness for Youth Focus, an organisation that delivers nationally-recognised counselling and other mental health support programs to young people. Participants of the event set off from Albany or Geraldton and ride to Perth in a four-and-a-half day journey consisting of 700kms, visiting several high schools along the way to talk to kids about mental health. We all wish you the very best of luck, Dan! If you would like to contribute to this incredible cause, please visit www.rideforyouth.com.au to make a donation.